Firstly stir the butter until it becomes soft. Then add the sugar and blend that well. Add one egg at a time and whisk well between each egg you add. Mix flour and baking powder together and sieve half into the mix. Blend well. Then add the milk and sieve in the rest of the flour mix. Whisk until it is all properly mixed. 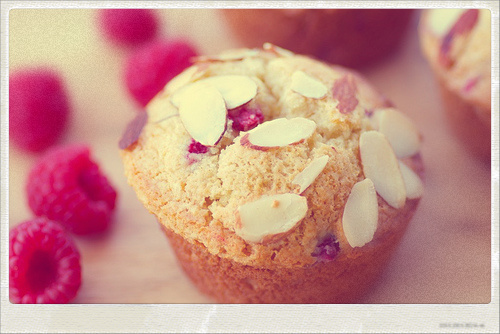 Then divide the dough between approx 12 muffin cases and add some raspberries in each. The cases should be about 3/4 when both the dough and the berries are in. Bake them in the oven for 20-25 minutes at 175 degrees. You can check if the muffins are done if a match comes out clean from the middle of the muffin. need the american convertions for the measurements… How much is a dlp? I want to try them! Here are the approx measurements for you! Thanks. but unable to get to my computer for a LONG time so I think I am now trying to catch up. 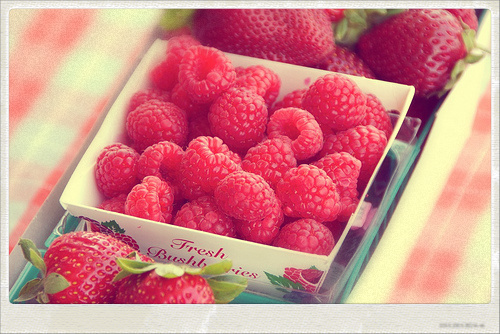 Raspberries are my favorite fruit, too – these look delicious!